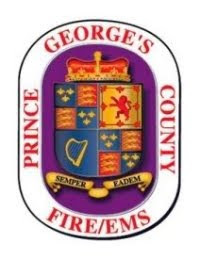 Teamwork of an unknown Good Samaritan, a County Police Officer and members of the Prince George’s County Fire/EMS Department resulted in a life saved on Saturday, December 12. Just before 12:30 pm Firefighters and Medics from the Fort Washington area were alerted to a 911 report of a crash with injuries and CPR being performed. It appears an adult male, Jorge Mondino of McLean, Virginia suffered sudden cardiac arrest while driving on northbound Indian Head Highway (Route 2100 Near Palmer Road. While the driver was unconscious, his vehicle appears to have rear-ended another before coming to a stop. In total, 3 vehicles were involved with 2 adults and 1 child being taken by ambulance to area hospitals for evaluation and treatment of minor injuries. One adult male was found unconscious and not breathing. A Good Samaritan female was the first to stop and initiated cardio pulmonary resuscitation (CPR). A County Police Officer, Dale Sollars, arrived on the scene quickly and went to assist with CPR. Sollars has 12 years of previous experience as a Firefighter/Medic and knew exactly what to do until medics arrived. The heavy-duty rescue squad from Fort Washington Fire/EMS Station 847 was the first fire department to arrive. Firefighter/Medics Steve Zamary and Tom Joachim obtained the automatic external defibrillator (AED) and applied it to the victim. The AED analyzed the patient’s heart rhythm and provided 1 shock in an attempt to “jump-start” his heart into a normal rhythm. The Paramedic Unit from Fort Washington 847, staffed by Firefighter/Medics Tim Vanderhoff and Latonya Hackley, arrived shortly after and used their Lifepak 15 monitor and defibrillator, a more sophisticated piece of cardiac equipment, to monitor the patients heart rhythm. The medics provided another 2 shocks per protocol. The patient responded with a spontaneous pulse and medics continuing to assist with the patients breathing. The ambulance crew from Fort Washington, staffed by Firefighters Mark Verdonock and Devin Watson, assisted medics in treating the cardiac patient and transporting him to a nearby hospital. Medics stated their patient started to regain consciousness and talking just before delivery at the emergency department. Because of the actions of a Good Samaritan Police Officer Dale Sollars and the Firefighter/Medics from the Prince George’s County Fire/EMS Department, the 73-year-old McLean man will soon be released from the hospital and celebrate Christmas at home with his family. On Thursday, December 17, the wife and daughter of Jorge Mondino met with Police Officer Sollars and Firefighter/Medic Latonya Hackley at Police Department Headquarters in Landover. The family expressed their sincerest gratitude to everyone involved. Firefighter/Medic Hackley, speaking on behalf of her crew, said everything fell into place with early notification to 911, bystander CPR, early defibrillation and transport to a hospital. Mrs. Mondino said that having her husband at home on Christmas Day is the best gift she has ever received. After the press conference, Assistant Fire Chief Brian Frankel presented a PGFD "Life-Saving"
Challenge Coin to Police Officer Sollars for his efforts on this incident.